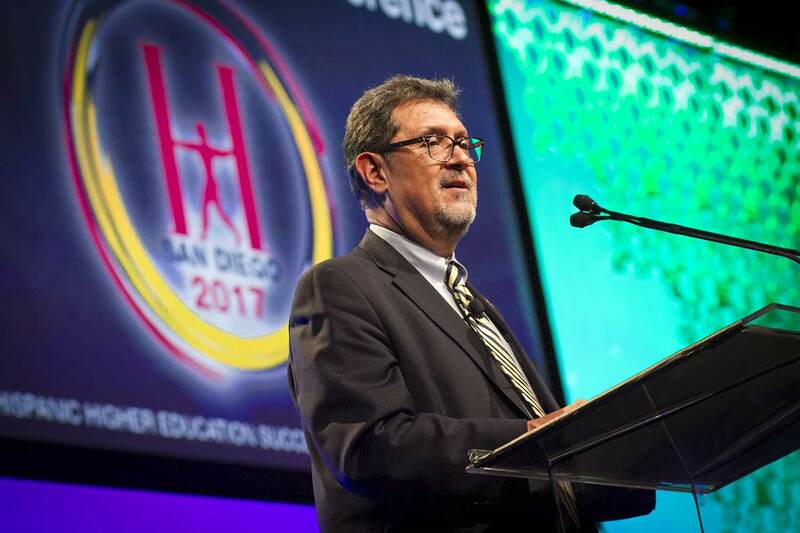 Academic leaders from UC San Diego connected with education advocates from across the nation at the 31st annual Hispanic Association of Colleges and Universities (HACU) conference Oct. 28-30. Photos by Erika Johnson/University Communications. “We need to activate, work with legislators and with the community,” said UC San Diego Vice Chancellor for Student Affairs Juan González to a packed room of education advocates, those who recognize the need to improve pathways to education for Hispanic students—the fastest growing college demographic in California. As a member of HACU, UC San Diego is part of a network of 470 colleges and universities across the U.S. that is committed to Hispanic higher education. HACU leads advocacy efforts to gain funding and support for federally recognized Hispanic Serving Institutions (HSI). To become an HSI, a university must have a minimum of 25 percent total undergraduate enrollment of Hispanic students as well as an infrastructure that supports academic excellence and student success. Currently at 19 percent enrollment of undergraduate Hispanic students, UC San Diego is an emerging HSI. Chancellor Khosla, Vice Chancellor González and Frances Contreras, Associate Vice Chancellor for Equity, Diversity and Inclusion and Associate Professor of Education Studies, represented UC San Diego at the conference. The event was an opportunity for academic leaders to expand partnerships, deliberate policy issues affecting educational opportunity as well as showcase successful initiatives. 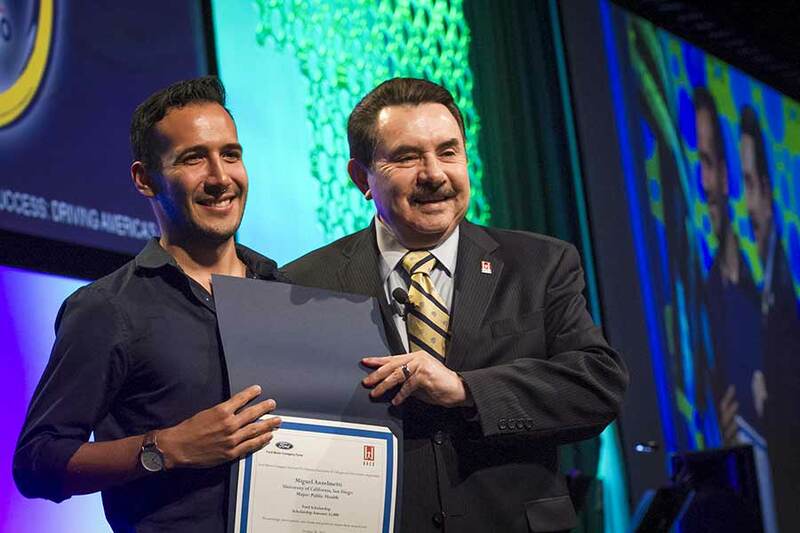 UC San Diego undergraduate Miguel Anzelmetti was awarded a Ford Scholarship at the conference. As a silver co-sponsor of the conference with the University of California Office of the President, UC San Diego hosted a reception to connect with other influencers, which included UC Regent Charlene Zettel; Silas “Sy” Abrego, a member of the California State University Board of Trustees; as well as Antonio Flores, President and CEO of HACU. “As a long-time member of HACU and advocate for Chicanos and Latinos to not only be represented in our student bodies, faculty, and administration but to be leaders, I am personally pleased to be in your presence representing the University of California and the San Diego campus,” said Vice Chancellor González at the reception. The three-day conference offered numerous tracks focused on grants and fundraising; executive leadership; advocacy and policy; and academic success. Contreras spoke on “Transforming the Next Generation of Latino Students Through HSIs” along with doctoral student Katherine Garcia and undergraduate student Adan Chavez. The conference was also an opportunity for students to network with their peers from across the country. Eight undergraduates and one graduate student from UC San Diego attended the conference. Miguel Anzelmetti, an undergraduate intern at UC San Diego’s Raza Resource Centro, was chosen to receive a $1,000 Ford Scholarship. For doctoral student Katherine Garcia, the conference was an opportunity to present research conducted on the experiences of Hispanic students and the support services that can be developed to improve time to graduation. A first generation college student herself, Garcia is working alongside her advisor, Professor Contreras in Education Studies, to strengthen the pathway to education for underrepresented students.